Starting today, certain aspects of Google’s mobile search are receiving a big speed boost. The most interesting feature that is being added is a new “Quick view” tab which will appear on certain page results. 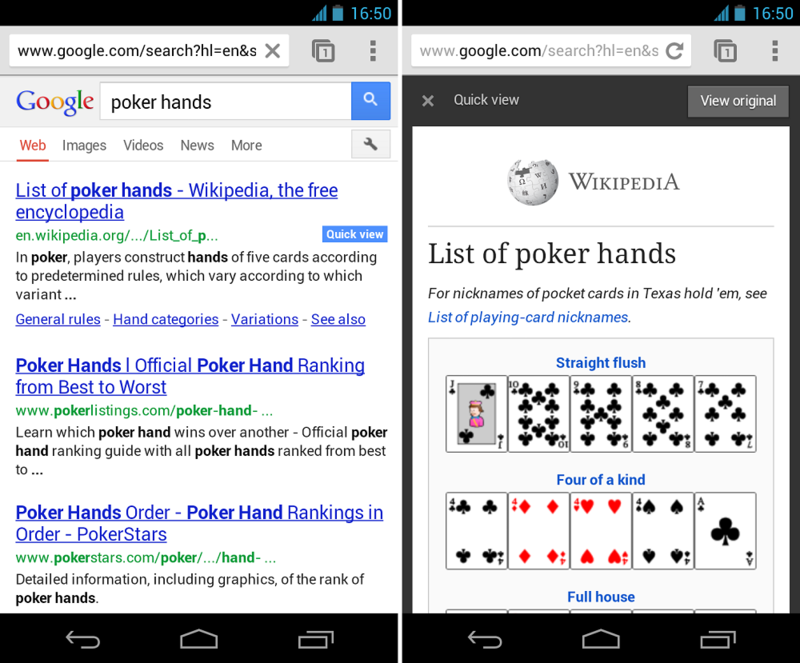 For example, as shown above, when a search is done for a list of poker hands, a quick view can be seen from Wikipedia to make finding the answer you are looking for even easier. Along with Quick view, Google search has also enhanced returns for Rotten Tomatoes. Now, there’s a faster way to get to the Rotten Tomatoes page with just the info you need most — just look for a new quick link for “In Theaters” underneath the main Rotten Tomatoes link when you search on your mobile phone. You’ll see these expandable sitelinks appear for many sites to help you get to a specific section quickly. As a note, Quick view is currently only available for Wikipedia pages in English, but they are looking to expand this to additional sites.